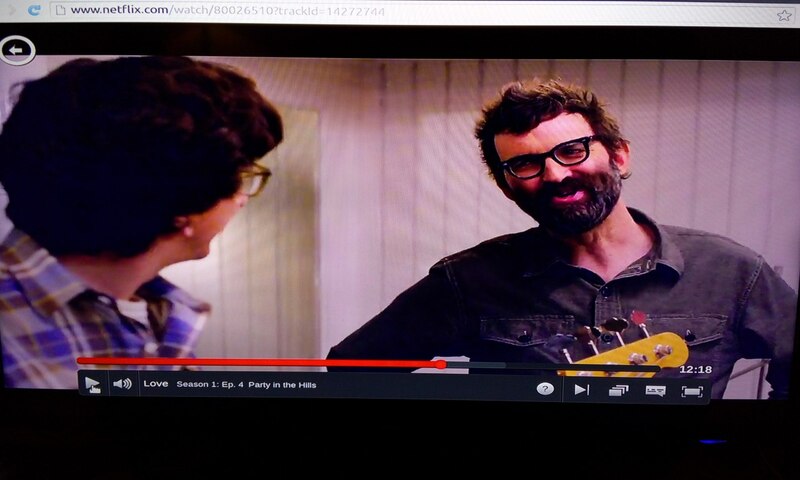 I must confess that I suspected a hoax when my youngest daughter told me that E, Mark Oliver Everett of Eels, appears in a new Netflix series, Love. Naturally, curiosity got the better of me and, sure enough, there he is in episode four. He doesn’t exactly act in this scene, but maybe he’s branching out a little. I’ll say now that I didn’t watch the first three episodes. This entry was posted in Internet, Music, TV on 29/02/2016 by garymoore. Loving the More 4 Father Ted (Jack) back-to-back tribute tonight. 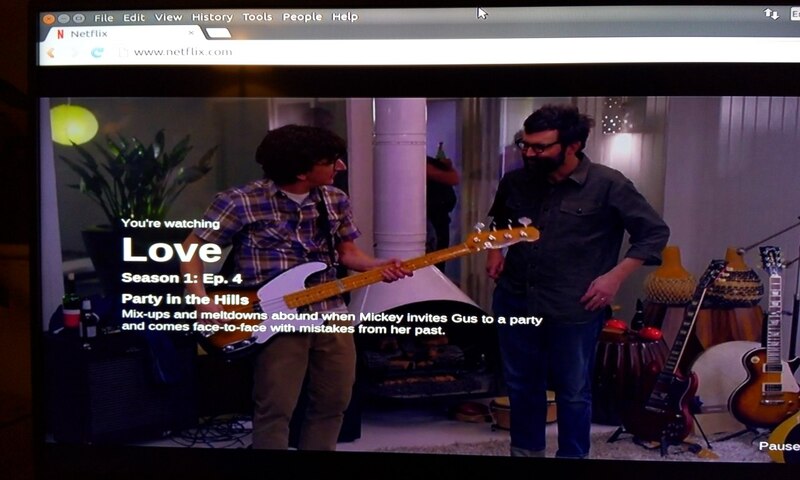 This entry was posted in Beer, TV on 28/02/2016 by garymoore. Father Jack is no longer with us. Sadly, Frank Kelly passed away today. If there was a God, which there obviously isn’t, one would connect the date to the passing of Father Ted himself. So sad though. For a minute or two, just listen and appreciate. This entry was posted in People, TV on 28/02/2016 by garymoore. After a day of decorating at my mother’s, I’m somewhat achey. Fortunately, I have a vitamin drink to restore me to normal. This entry was posted in Beer, Family on 27/02/2016 by garymoore. Days. Yes, 339 days until we’re mortgage free. Regular updates may follow. Particularly from the 309 day point. This entry was posted in House on 26/02/2016 by garymoore. Well, as expected, my second in command is now without her special broken foot shoe And one crutch. She has now returned to matching shoes, although her Ugg boots do appear now to be different in colour/shade. Presumeably, since only one has been worn for some time now. 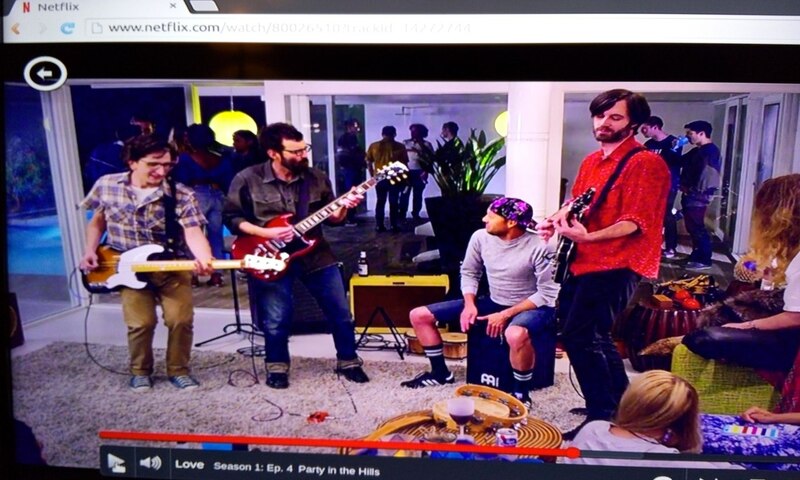 A minor celebration was allowed. Mostly because my significant other’s breakage was significantly worse than initially explained. It now transpires than an ankle was also broken. While the issue wasn’t highlighted at the beginning of this journey, I do understand that there may have been a desire not to panic my second in command. It’s all over now though. We’re now a single crutch household. And, after a week or two, we shall move to a walking stick. This entry was posted in Beer, Health, Pubs on 26/02/2016 by garymoore. From the end of the week, I’ll no longer be able to refer to my second in command as Stumpy. Her cast’s been off a couple of weeks now and the special broken foot shoe should be gone on Friday. Care is being taken not to break anything else. This entry was posted in Health on 24/02/2016 by garymoore. Found an old picture from a few years ago. Taken in Germany. A builder’s van. They may have some connection to asphalt, car parks, or both. This entry was posted in Travel, Weird on 19/02/2016 by garymoore. There’s an annual festival in Whittlesey. 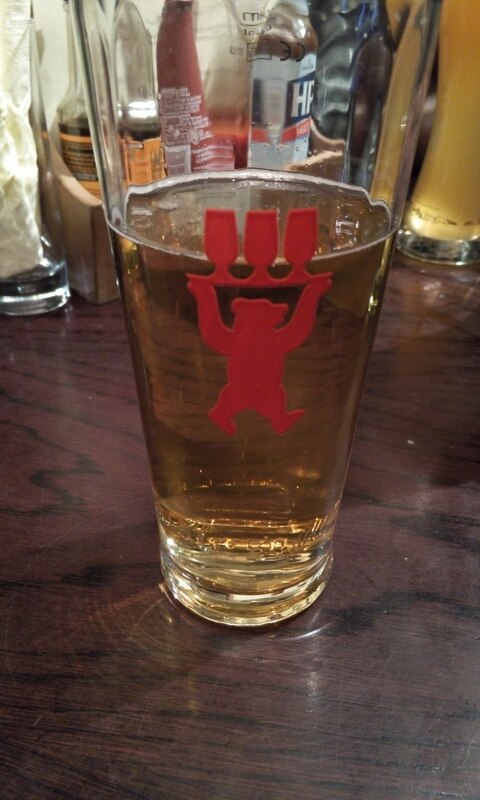 A straw-bear-beer kind of festival. Basically, a bloke dresses up in a bear costume (straw is involved), then people follow him around, drinking beer. A couple of weeks ago, Eidnan told me about a straw bear beer, although I may have not quite recollected the name correctly. I was also somewhat critical, mainly since real ale may not be halal. Or it might be. In the City Tavern this afternoon, I noticed Strawbeer at the bar. Realising that Eidnan’s preferred beer may not be suitable for vegans/vegetarians, I asked whether the beer contained anything dead. 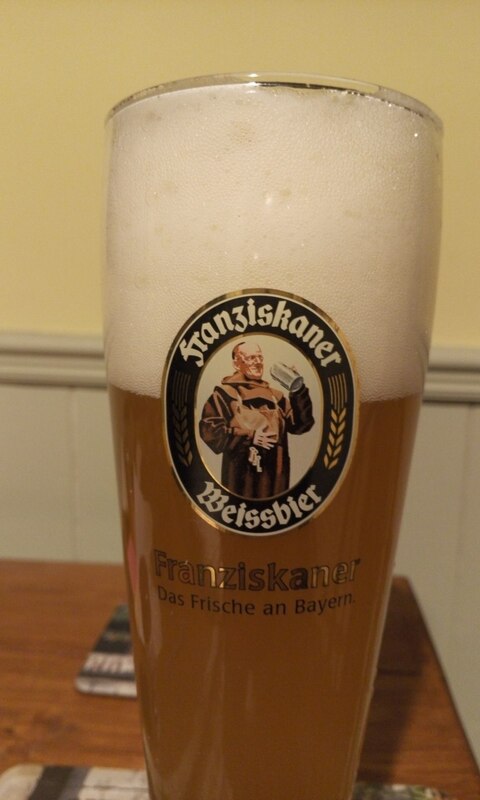 On being told it was fish free (the little display in front of the pump was pretty cloudy anyway), I purchased a pint. I’d love to say that it was gorgeous. It wasn’t though. But it was OK. No, it was nice. It was a great colour and was a bit cloudy. And it was nice. I probably should have taken a picture of my beer, but I neglected to capture such things. The pump attachment was probably worthy of theft, but I abstained. Soon after, in Lady Greys, I had a delicious Berliner Pilsner. I did take a picture of this one, even debated stealing the glass. I didn’t though. 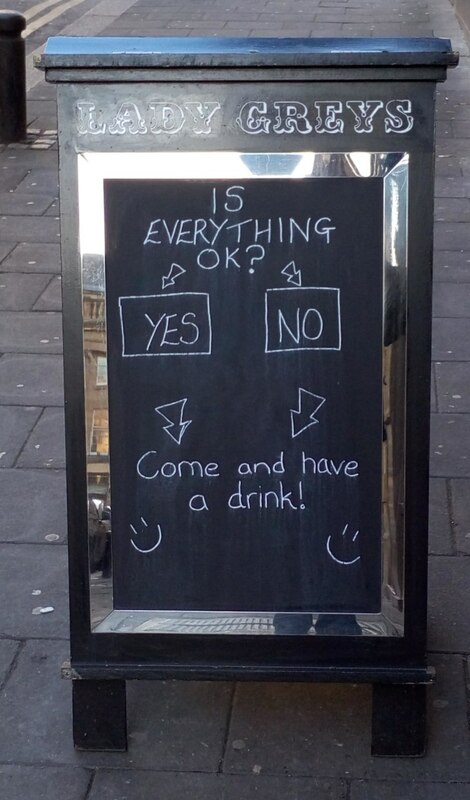 On leaving the pub, we observed a sign outside in the street. It was somewhat relevant to my lifestyle, but I decided not to steal the sign (well, I’d have gotten chalk all over myself). And then we went home. That last part may not have been wholly truthful. This entry was posted in Beer on 18/02/2016 by garymoore. Well, I finally gave in and bought a pair of varifocals. For work mainly, since I sometimes struggle to read small print in meetings. I bought them from an online shop; a good price and decent quality. Next time I order glasses, though, I shall do so when sober. I may have purchased glasses with red frames. This entry was posted in Shopping, Work on 17/02/2016 by garymoore.